It is really very useful and easy to activate virtual desktops on Windows 10, for multiple work spaces on the desktop to have more space on your screen! Just press the key combination Windows Logo + Tab then appear at the bottom of the desktop currently open desktops. Via next pressing of the key combination Windows Logo + Tab, switch directly to the next open virtual desktop in Windows-10. By a click on the corresponding desktop, you can go directly switch to one of the Windows-10 virtual desktops. 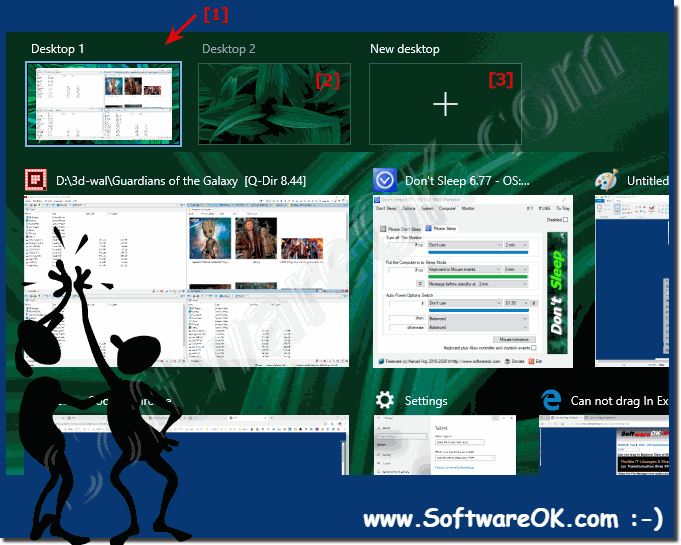 (Image-1) Multiple virtual desktops on Windows 10! Windows-10 - FAQ-4: How can I use multiple virtual desktops on Windows 10?